Is it me, or does it look a lot like Ladian Tomlinson was hit by Lex Luthor's evil energy-sapping ray? I mean, not too long ago, L.T. would hit the hole and be past the linebackers ina flash. This year, it feels like it him takes a half an hour to get to the line. Jason Campbell....once again....good stats, no results. Seems like he's just one of those guys who's numbers look respectible, but doesn't get the job done. Seems like all those LenDale White has matured articles were a tad premature. Speaking of which, Jay Culter. Say what you will about him, man when his head is on straight, the man still throws a pretty ball. Just too often—what with having 1.8 seconds to pass pass before he gets sacked—it's too the wrong team. College football rankings are ridiculous. Why is Stanford ranked in the top 25? With 4 losses, including a terrible loss to Wake Forest, one good win over Oregon and a ballyhooed win over a vastly overrated USC team, is this really a top team in America. Heck CFN ranked them at 13!!!!! What the heck? According to local reports, the Yankees will not be resigning Johnny Damon. Which is too bad. I think in a certain, short role, he would have had a lot to offer the Yankees, for say two years. If he still wants a fat contract, though, then this is the right move for the Yankees. In showing what is ridiculous and silly about sports blogs, one baseball web site actually postulates the theory that Joe Mauer, once he becomes a free agent next season, might sign with the Yankees. Um, no. The Twins would have to fold up as an organization if they even let the possibility of that happening. Now, I'm enjoying the salaciousness of the whole Tiger Woods fiassco as much as the next guy, but really, Rick Reilly, do we need to know everything that happened? Why do we? No one was seriously hurt, nothing really went wrong in a public need to know kind of way. Why the journalistic self-rightousness? This would be a smart move for the Pirates if they can pull it off. And no surprise for the AAPTBNL Man of the Week. 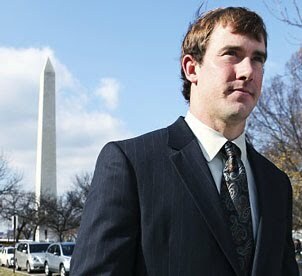 If you throw 5 TD passes with no interceptions while playing against aBill Belichek coached team, yeah you get the award. Congrats Drew Brees. And finally something odd but interesting—wished it had been reported more. Russ Ohlendorf, young, promising pitcher is doing something interesting in his offseason. No, not strip clubs, or St. Bart's. This young Princeton grad is going to Washington D.C. to work in the government. Ohlendorf, who with his father, are involved with the cattle business, is serving an internship at the Department of Agriculture. Ohlendorf said he wants to learn more about how government and agriculture work together. "So this was a really good opportunity to combine the two," he said. Congrats to Ohlendorf for doing something worthwhile with his free time. And best of luck to you Russ. Well LT has hit that magical 30 year mark in which almost all running backs see a sharp decline. He is just averaging 3.4 yards per carry now.